Iowa spring turkey season starting with opening day flocks are together. It is common to see 4 to 6 mature toms traveling with dozens of hens, jakes mixed in. Skill is required to draw toms away. No other way to cut it. Those with calling/decoying skills will find toms to pick from. Others will work harder. 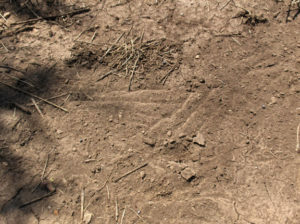 Until the fields are worked to plant to crop, the birds have a wide variety of food sources. Their patterns at times may be unpredictable. Roosting areas may change from day to day, so with a short season it is important to be able to adapt to current daily behavior of flocks adjust accordingly. Locating a flock then following them throughout any day to/from their roost has been a productive style of spring season hunting for our members. This has been true throughout many years. While following a flock, it is very likely to come across several other groups or toms on their own without a hen. A good opportunity to switch gears to zero in on a lone gobbler, if such an opportunity presents itself. One great advantage in Iowa compared to Missouri or Kansas is a lack of pressure. Especially on MAHA leased land. Un-pressured birds are much easier to work with a call making them more vulnerable to come to a decoy. No surprise in this statement. Its posting here is to identify to readers we recognize all elements of a good hunt. A quality hunt is the product we know the hunter wants. During later seasons Iowa is very similar to north Missouri, but again, having much less pressure. Nearly the same population of easterns per square mile, that is along Iowa’s southern state line. Once birds break up they can be on any given farm at any given time of throughout daylight hours, but timbered creek bottoms, ridges or small wood lots should be habitat of choice to focus at this phase. If lack of time to scout is a problem, setting up on top of any timbered ridge or next to a wood lot at first light waiting for a gobble to move on is a very effective method. Hearing 5 to 10 gobblers or more at first light is not uncommon. Once fly down they have ample forage to feed on in timber through many green pastures or early crop fields to strut on. 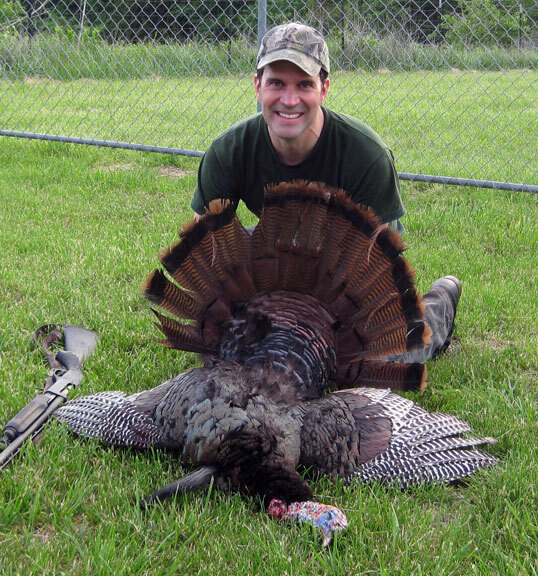 Many of our landowners encourage turkey hunting, since their population has expanded so much over the last 10 years. Lack of pressure has turned Southern Iowa into a quality Eastern locality. MAHA has much prime leased land in southern Iowa having only a handful of hunters each spring. What more can an avid spring turkey season hunter ask for? Robert W., like so many of our do it yourself spring turkey season hunters hunts alone. This is from his first Iowa trip. 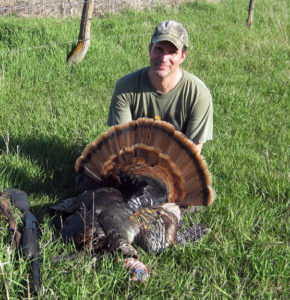 One advantage a self guided wild turkey hunter has when being a member of this Association is its owner/operator, Jon Nee, turkey hunts. He has so since being a child, scouts all land prior to contracting, scouts much land pre season, supervises reservations, recommends new members where to hunt for what they are after, manages our budget and so on. In short he runs the entire show with pride which motivates his effort to ensure everyone can have as good of an experience possible. Iowa spring turkey has a lot working against it. That is compared to other states. Results have been many self guided hunters chose not to hunt Iowa. Our hunters reflect this. Even with knowledge our private lease land awaits them. Disadvantages begin with more liberal OTC tags with accompanying seasons in Missouri or Kansas. Not too much further of a drive when planning a trip. Then add to this mix Rio Grande and Easterns both may be hunted on one trip. 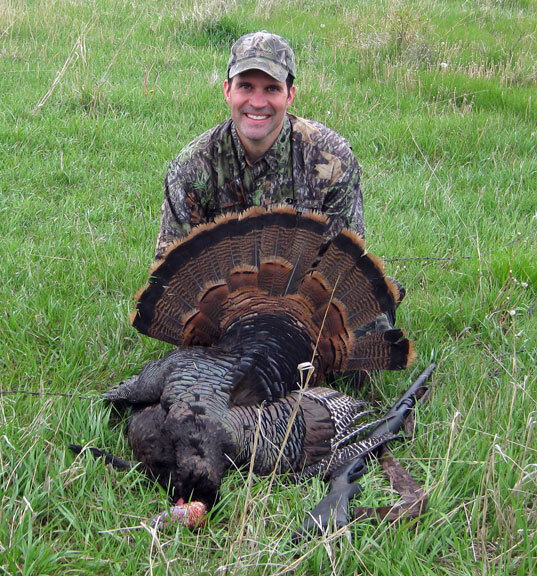 Iowa spring turkey includes a non-resident draw tag system. It requires application by January for a broken period of April seasons. Many hunters find this long term planning difficult. Those who do may do so making a special effort to add one more tom to their list of states hunted. A hunter who does choose to hunt Iowa includes one who is making a campaign of harvesting five available tags possible on our land in these three states of Iowa, Kansas, Missouri. 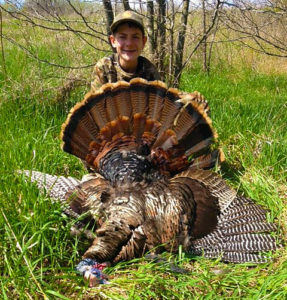 Iowa’s spring turkey one tom limit further detracts. Missouri and Kansas both allow two. Here’s a picture I have not yet seen on your web site. I saw some birds milling about opposite of my setup where some took to scratching. After I tagged my tom I wondered around a bit founding their dustin’ spot. Looks like old and new scratching’s or a favored spot. No rhyme or reason why they were where they were well away from their roost and where I had scouted them yesterday. Its an edge of a hay field away from all crop fields. There are advantages to Iowa’s spring turkey season. These withstand comparison to Kansas and Missouri. First, fewer hunters state wide. On MAHA leases even more so. MAHA lease land has had a 99% success rate. This compares quite favorably to Iowa’s statewide average of 22 to 46%. Our private land is in south central Iowa. A region that routinely has higher year to year flock counts. A population advantage inclusive of toms. It also includes the more sustainable statistics of hen, hens in spring with young. Additive to a fine trophy whitetail population. While there does exist advantages to the Association’s Iowa spring turkey hunting its long term outlook is limited. There are some turkey reproduction environmental limiting factors that cannot be overcome by anyone. One is poor existence/renewal of tall grass CRP. Or, limited nesting cover. Another is farm improvements by use of bulldozers. Results of this changing environment are readily apparent in posted surveys. Overall, Iowa’s year to year turkey numbers are decreasing when compared to its previous 10 year averages. For those in our Association who want a do it yourself Iowa spring turkey hunt we have private land, good habitat, and good bird numbers. 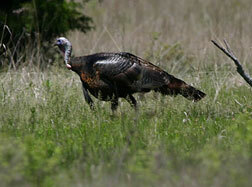 Overall this article may seem to discourage an Iowa spring turkey hunt. That is not our intent. Intent is perspective development. Or, never over sell. There are plenty of large toms to be hunted. Iowa is one more choice for the Association hunter.